Horseback and walking units, floral floats, vintage cars, and decorated vehicles are in a great hometown parade that celebrates aspects of the workers’ camps in plantation towns. Each camp had its ethnic identity, customs, foods, games and sports, music and dance. This is a festival signature event, don''t miss it! The people walking, on decorated floats, on horseback, and in decorated vehicles will do their best to capture some aspect of plantation life. They will have colorful costumes, perhaps play music or dance, or showcase recreational activities — baseball, chicken fights, fishing, to name a few – or their ethnic heritage. Others will capture memories of the sugar era, when sugar plantations thrived and many residents worked for or with the sugar industry. Competition for parade awards is intense and people from the resorts, businesses and community groups are very creative, so you can expect the unexpected. From costumes to decorations and choreography, they work for weeks and up to parade day to make their ideas become reality. While most of us relax and enjoy the parade, the judges seated along the parade route will intently scrutinize the units. In the afternoon, the awards for the best in each category are announced at Koloa ballpark. 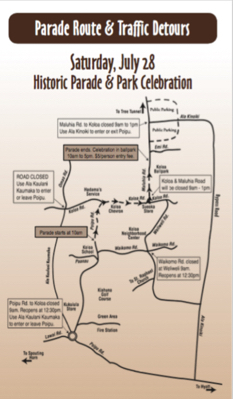 PARADE ROUTE will commence at Koloa School, proceed north onto Po`ipu Road, turning right at the intersection of Po`ipu Road and Koloa Road and finally turning left on to Maluhia Road, finishing at the Anne Knudsen (Koloa) Ballpark. 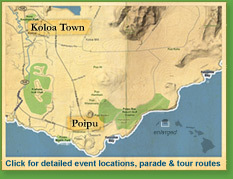 ROADS OPEN for travel in and out of Po`ipu are Ala Kalanikaumaka (traffic to and from the west via Koloa Road) and Ala Kinoiki (traffic to and from the east, via Maluhia Road). PARKING will be available in the pasture lot north of the Anne Knudsen (Koloa) Ballpark as well as the pasture lot north of the intersection of the bypass and Maluhia Road. Pedestrians exiting this lot should do so at the makai gate. A crossing guard on Ala Kinoiki will assist the pedestrians in crossing the bypass to get to the lower pasture and in to Anne Knudsen Ballpark. Other available parking at First Hawaiian Bank, Koloa and Oma`o roads west of Hadama`s Service. ACCESSIBLE PARKING for those with placards will be available at the ballpark (south entrance) and asphalt lot just mauka (northbound) of park. NO PARKING is permitted in the following areas: the Ballpark (except for handicapped parking, vendors and volunteers), Maluhia Road, Ala Kinoiki (Poipu bypass road), Koloa School, Big Save, Bothwick Mortuary. Road closures 9am to 12:30pm. Arrive early to get your favorite viewing spot! Parking available in two pastures just north of the ball park, and accessible parking next to the lower park entrance, as well as parking along some roads in the vicinity.